Geoarchaeology remains one of my scholarly interests. I still help advise graduate students at Uconn and elsewhere. One of these was Phil Glauberman, the lead author of a recent paper Flint Taphonomy. He was a Ph.D. student of UConn’s Dan Adler, who I had the pleasure of teaching in the 1990s. My most recent archaeological paper was co-authored with Brian Jones (state archaeologist) and Dan Forrest (State Historic Preservaton Office), and published in a special issue of Quaternary International in 2013 (see vitae). 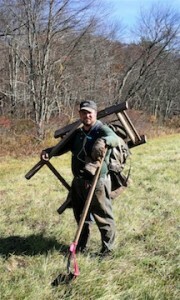 Photo: Unnamed crew member of a federally funded (U.S. Army Corps of Engineers) archaeological reconnaissance in Mansfield Hollow State Park in 2001. I served as a consultant to the project.